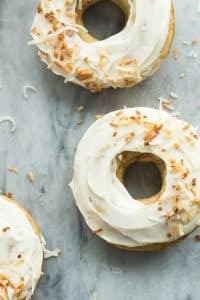 These Carrot Cake Baked Donuts with Cream Cheese Frosting are an easy donut recipe that is perfect for Easter brunch or a Spring party! Perfectly moist and slathered in a tangy cream cheese frosting. The best way to get your vegetables! Have you guys jumped on the baked donuts train yet? I’ll admit, it took me a little while. The first time I tried was a big fail, and I stashed my donut pans in the cupboard for quite a while afterwards. But once I busted them out to make these Lemon Blueberry Donuts, I never looked back. Since then these Apple Cinnamon Baked Donuts and these Maple Glazed Apple Crisp Donuts have made their appearances, but it was time to add another to the must-make list. Are you a fan of veggie desserts or no? I know for some they can be a tough sell, and I used to be one of those people. When I was a kid, I remember my cousin had carrot cake for her wedding cake. And I just couldn’t wrap my mind around it. I still remember my disappointment to this day. For a 10 year old kid, what is a wedding without cake?? And there is only carrot cake?!? It felt like the biggest rip off! But I’ve since come around, and while carrot cake isn’t right up there at the top of my list, I will admit that it’s perfectly delicious with a slather of cream cheese frosting. Without the cream cheese frosting? Not a chance. I mean, my girls will eat just about anything in donut shape, frosting or not. The fun shape gets to them and I have to hold them off to get the frosting on (which isn’t a bad problem to have, I guess, especially if they’re getting extra veggies!). Usually, I add crushed pineapple to my carrot cake because I do love pineapple, in desserts or dinners. But I didn’t want to mess with my favorite baked donut recipe too much and alter the liquid, so I left it out this time. Feel free to add in raisins or nuts if that’s your thing! 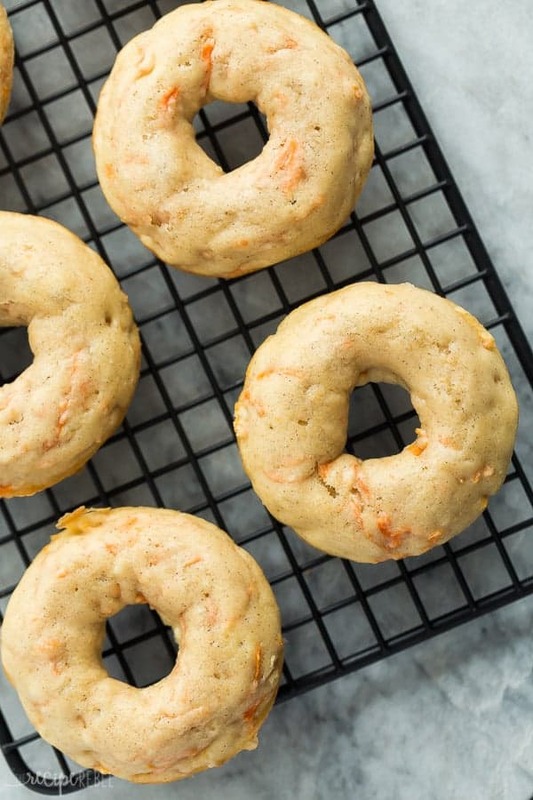 You will need a non-stick donut pan for this recipe. If you don’t have one, you can probably bake the batter into muffins but I haven’t tried that, so I can’t give any advice on that. The donuts pop out easily after a couple minutes of cooling, so don’t worry if you only have one pan! Feel free to add in raisins or nuts, whatever suits your fancy! 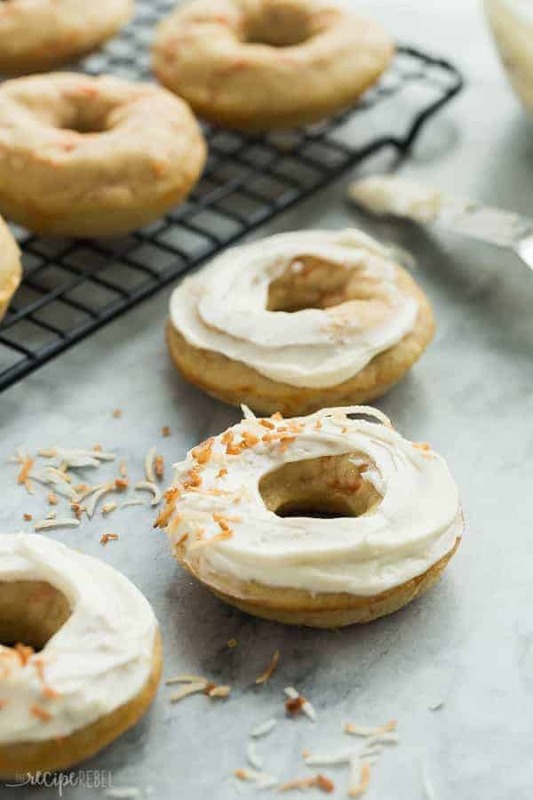 These donuts freeze perfectly, so they’re great for making ahead! Preheat the oven to 425 degrees F and lightly grease your donut pans. Set aside. In a large bowl, stir together butter and oil. Add sugar and whisk until combined. Add milk, eggs, vanilla and whisk until combined. Stir in carrots. Add flour, baking powder, cinnamon, salt, baking soda and nutmeg and stir just until combined. Spoon or pipe batter into prepared pans, about 3/4 full. Bake for 7-8 minutes, until a toothpick inserted in the center comes out clean. Let cool for 5 minutes before removing to a wire rack to cool completely. In a large bowl, beat together cream cheese, butter, and vanilla until smooth. Add powdered sugar and beat until smooth -- this might take 4-5 minutes but it will come together! 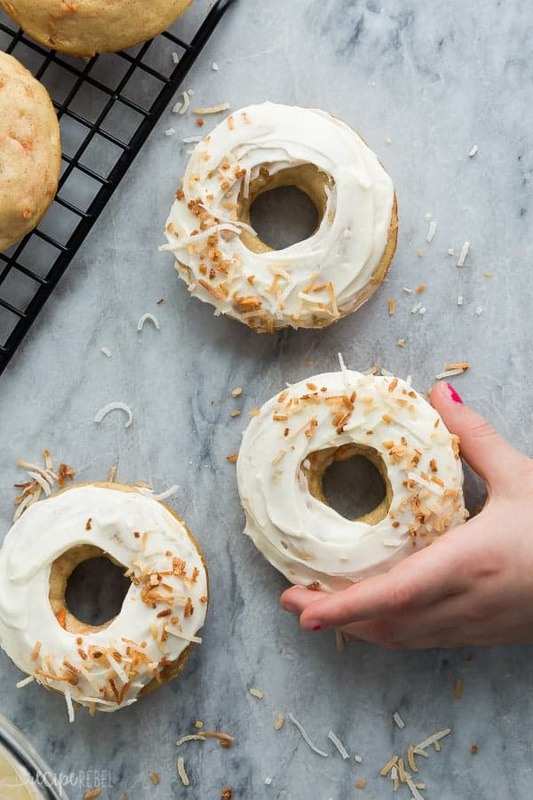 Spread on cooled donuts and decorate as desired (I used toasted coconut!). Serve. 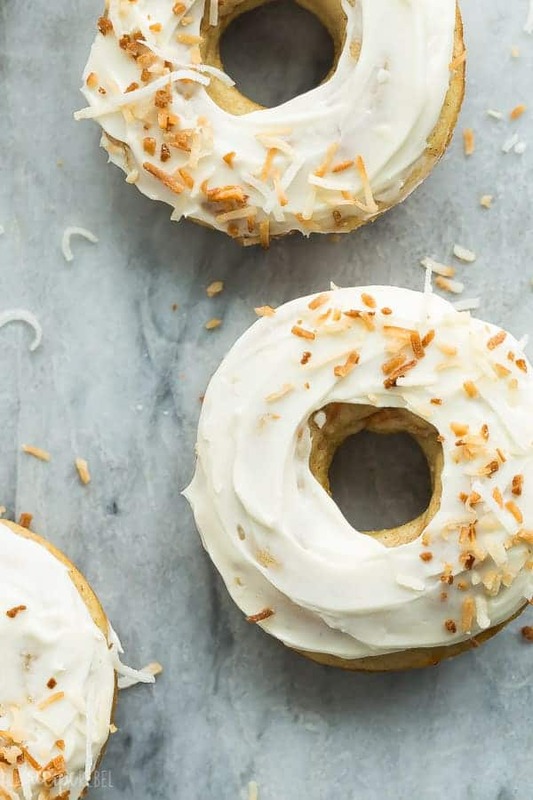 Can i make these in an air fryer since donuts are usually fried? Thank you! Sorry, I have zero experience with an air fryer! These donuts would be an awesome way to start the day! So perfect for Spring!